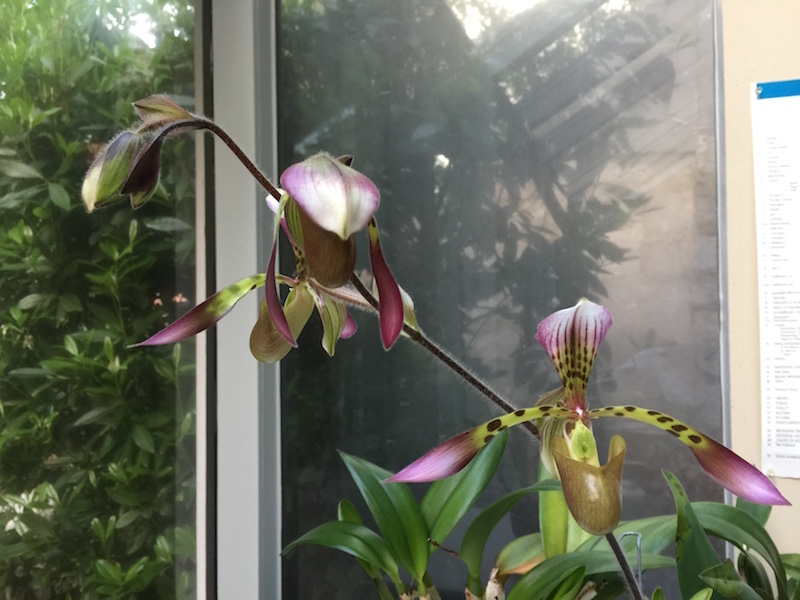 It had been about a week since my Paphiopedilum Haynaldianum had blessed me with the privilege of making my first flower essence when my friend Don Dennis, creator of natural healing remedies at Living Tree Orchid Essences, encouraged me to name it. Everybody has their talents, but coming up with amazing titles is not mine. I spent a huge amount of time asking for guidance before coming up with the titles for my recent Amazon No. 1 best sellers, What Is Healing? Awaken Your Intuitive Power for Health and Happiness and Unlimited Energy Now. Not that I hit any home runs or anything, but you have to come up something no one else has thought of that evokes the right vibration at that particular point in time. It took me a whole week to name one of my cats, but finally after a week I noticed I kept calling him, “Come here you little Rascal,” and the name stuck. Making a flower essence from the gorgeous orchid blooming for the second time in my studio felt like enough of a blessed event, so when Don pointed out to me that I need to come up with an actual name, I felt a bit flummoxed. I figured I would have to meditate for days or ask my friends to come and meditate with me. Each time I take the essence, I find that it energizes my third eye, crown chakra and the palm of my left hand – the receiving hand. My guidance has told me that the essence of Paphiopedilum Haynaldianum is here to help all of us receive the beauty of the world. I have been pondering how to explain this to others. It seems so obvious to me whenever I walk through my garden or gaze upon the orchids in my studio. I feel a deep reverence. Many people are focused on the vast tragedies occurring everywhere. I need not name them as I don’t really want your mind going there right now. Meanwhile, nature is constantly here supporting us, uplifting us, keeping us alive, literally and figuratively. The body of the earth is very much like our physical bodies. We don’t tell our lungs to breathe, they just do. We don’t tell our hearts to beat, they just beat. Those of us who focus on the vibration of tragedy often lose hope, not only for ourselves but also for the world at large. But I do not feel that this is the truth of what is actually happening. To me, there is a spectrum from depression, discouragement and tragedy to reverence. First, we can begin to feel a glimmer of hope. Maybe things are not as bad as we first perceive them to be. Second, we can feel gratitude. When we recognize that the earth and all of nature is constantly supporting us – even when we pay no conscious attention to this fact – we can feel uplifted and grateful for all our many blessings: the sun shining, the air we breathe, the exquisite beauty of the orchids, which thrive somehow and create incredible scenery even if we do nothing to support them. Finally, as we fill our hearts with hope and begin to feel grateful for all our blessings, we come to this feeling of reverence, a deep respect for all of life. I feel reverence is the message of Paphiopedilum Haynaldianum and therefore this must be its name. I sent Don Dennis a message through Facebook asking him what he thought of the name Reverence. He agreed that this is the perfect name. Four of my friends had calibrated the vibration of this essence incredibly high. On the scale of levels of consciousness developed by Dr. David Hawkins, M.D., anything over 600 is enlightenment. You can download Dr. Hawkins’ chart of levels of consciousness for FREE at this link on my website. My fiancé, Ken Holmes, calibrated the orchid essence of Paphiopedilum Haynaldianum at 618. My friend Nina Lynn calibrated it at 670. Charlenne Carl calibrated it at 620. My mentor in healing, Sue Maes, calibrated it at 630. Don Dennis confirms that he finds that all the Paphiopedilum species in greenhouse emit very high vibrations. Any substance vibrating at 500, which is love, or even 540, which is unconditional love, is incredibly healing. All illness is simply slowed down vibration. Healing happens when we surround ourselves with high frequency vibrations. Of course, all we really have to do is to feel reverence for nature and the beauty of the orchids who support us and uplift us even when we are not paying attention. Therefore I am pleased to introduce to you Reverence, my new orchid flower essence.